How Do We React to the Death of Cecil the Lion? 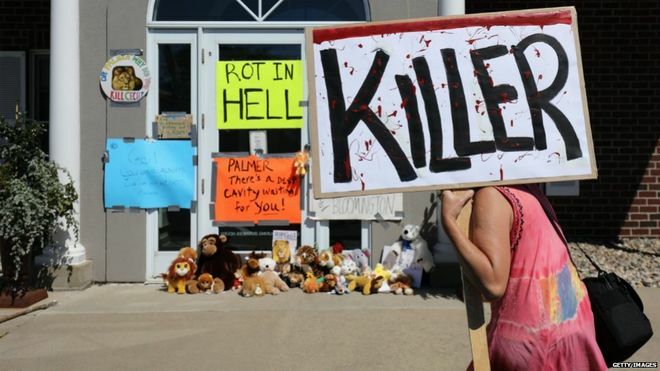 Protesters outside Walter Palmer’s dental office, which is now closed, on Wednesday, July 29th in Minnesota. Cecil the Lion is dead. Cecil’s death and our reactions say a lot about mankind. None of it is good. 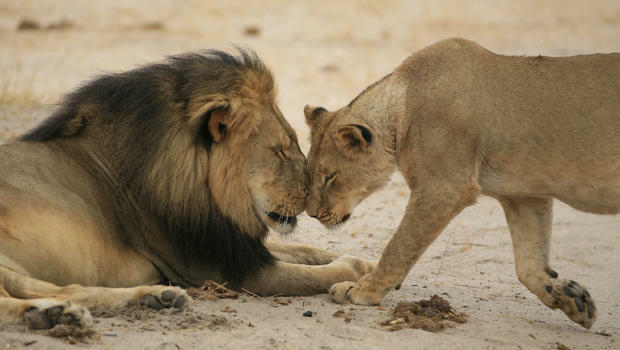 People are calling for the death of the hunter who killed Cecil the Lion. “He should die the same way Cecil died…” “He doesn’t deserve to live…” “I’d shoot him myself and not feel a thing…” are comments on my Facebook feed. The hunter is a dentist from Minnesota. Social media and news reports say his practice is closed now, he has removed his social media and he and his family have received threats. The people who write those threats aren’t far removed from the act they are criticizing. While these sentiments seem harmless and passionate on social media they are the violent rants of people removed from the harsh reality of much of the world. And they feed that harsh reality with their vitriol. A friend and wise man named Seth Y. observed on Facebook that the same week Cecil the Lion was killed a 12-year old girl in Nigeria blew herself up and killed 10 people in a suicide attack. The day before a 17-year old girl did the same, killing 20. There is also a civil war in Sudan, on the same continent where Cecil the Lion died, that has displaced 2 million people, many suffering from malaria, dysentery and cholera. There isn’t much about that in the social media feeds. We didn’t grow up on charming Disney animated movies about Nigerian suicide bomber girls or cholera epidemics, so there is little sympathy for the suicide bombing or the refuge crises. Instead we are incensed by the crucifixion of a Kimba surrogate and, in our vast empathy and righteousness, call for the perpetrators head. That makes us not much better. That’s no more right that killing Cecil in the first place. The sympathy for Cecil the Lion is well founded. He died a horrible and needless death. But the calls for harm to his killer have no more merit than the character of the man who killed him. That man lives in his own private prison. He carries the burden of every life he has taken. To threaten him is to join him. Our outrage at Cecil the Lion’s murder is well founded. Our behavior surrounding it is shameful. Our cycle of justified violence and exploitation of nature is the downward spiral that could eventually end this illusion we call “civilization”. There really never has been much civil about it. If you are truly outraged at the needless and tragic death of Cecil the Lion, then do something about it. Volunteer one Sunday at an animal shelter. Donate $50 to a fund that preserves wildlife. Write a letter to the Zimbabwean Embassy in the U.S. (Embassy of Zimbabwe, 1608 New Hampshire Ave NW, Washington, DC 20009  332-7100), adopt an animal from a shelter and give it a good life. Do something positive so the tragic and needless death of this lion becomes a rallying point for good rather than a lynch mob that destroys another life.